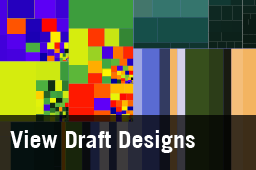 This site features draft designs and full views of the Treemap Art project. View more about the exhibitions. Although I conceived treemaps for purely functional purposes (understanding the allocation of space on a hard drive), I was always aware that there were appealing aesthetic aspects to treemaps. Maybe my experiences with OP-ART movements of the 60s & 70s gave me the idea that a treemap might become a work of art. That idea was revived in 2013 by way of my contacts with Manuel Lima who produced a beautiful coffee-table book on the history of trees that has several chapters on treemaps and their variations. aspect ratio of the entire image (square, golden ratio, wide, tall, etc.). In addition certain treemaps are inherently interesting because of the data displayed or patterns revealed. The aesthetic choices appeal to different viewers and the data displayed also triggers interest by different viewers. So even though treemaps are constrained by algorithmic rules, the aesthetic and data choices leave much room for creative explorations. The absolute size as hung on a wall or seen on a screen also changes the impact on viewers, as does the texture or reflectivity of the medium. Other choices that influence the impact are the number of regions and number of levels in the hierarchy. I believe that some topics yield data that have more salience for viewers: maybe sports data, political elections, Hollywood films, popular music, nature, pets, health, science, etc. For example, would the carbon emissions of countries around the world produce a treemap that could be laid out by the slice-and-dice or squarified algorithms and then colored in a way that would engage the eye and mind? Would the batting averages of all the players for the Washington Nationals (or New York Yankees or Boston Red Sox) interest sports fans? Colored rectangular regions have been a popular theme in 20th century art, most notably in the work of Piet Mondrian, whose work was often suggested to have close affinity with treemaps. Not all his designs are treemaps, but many are. 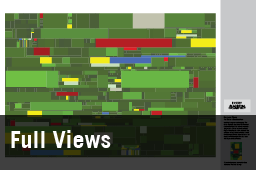 His choice of colors, aspect ratios, and layout are distinctive, so simulating them with a treemap is not as trivial as you might think. 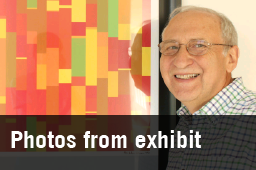 Gene Davis’ large horizontal paintings with vertical stripes of many colors were more easily generated with treemap layouts. The rectangles in Josef Albers “Homage to the Square” or Mark Rothko’s imposing paintings are not treemaps, but generating treemap variants triggered further artistic explorations. Other modern artists such as Kenneth Noland, Barnett Newman, and Hans Hofmann gave further provocations to the images in this collection. The treemaps were developed at the University of Maryland Human-Computer Interaction Lab starting in 1990 and have a significant history. Our software tool to produce treemaps is free to download and use. Several interesting treemaps are available to explore at the Hive Group, which has licensed our software. Their examples include itunes, nutrition, earthquakes, politics, etc. The treemaps generated with other commercial tools such as Macrofocus TreeMap show a variety of styles as do open source tools such as SequoiaView. In 2015, Microsoft added treemaps to the widely used Excel spreadsheet tool, enabling millions of users to easily create their own treemaps. Treemaps are often used by major journalistic publications such as the New York Times, Washington Post, The Guardian, BBC, etc. Interesting variations have emerged such as the Voronoi treemaps and circular treemaps. Wikipedia offers further perspectives on the topic as well as links to a list of treemapping software. I deeply appreciate the hard work of Minhaz Rahman Kazi inhelping me realize this idea and contributing much to the esthetics of the results. 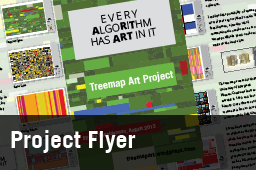 I’m gratified that the Treemap Art Project is on exhibition at the University of Maryland, the National Academy of Sciences (Washington, DC and Irvine, CA), University of California at Irvine, Swansea University in Wales, UK, University of Pretoria, and elsewhere. I was especially pleased to donate a full set of the 12 prints to the Museum of Modern Art. The full views are freely available for anyone to make personal use prints. A contribution of $500 to the UM Human-Computer Interaction Lab (http://hcil.umd.edu) will get serious collectors a signed and numbered print. Acknowledgement: Thanks to the UM Dept. of Computer Science for its help in arranging this exhibit and UMIACS for paying for printing and framing. Their support is much appreciated. Three environmentally-oriented treemaps hanging @sesync in Annapolis, thanks to Jospeh Jaja and @smorul. Very nice presentation of the leap from tech to art, Ben and Minhaz! As the artist who made the cufflinks, I would love to see more tree-map inspired art that utilizes non-computer media, perhaps fiber or wood, clay or paper.